From home accents furnishings to bedding, collectibles & window treatments, the Touch of Class online home decor catalog has gathered everything you need to create the mood and style you want in your home. 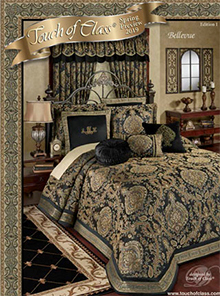 The Touch of Class home decor catalog is committed to taking the mystery out of fine home decorating. Choose your theme, select your colors, and then order the home accents furnishings and wall and home decor items you like from your theme and color palate. The experts at Touch of Class make it so easy to have the beautiful home you've always wanted! Check them out today!